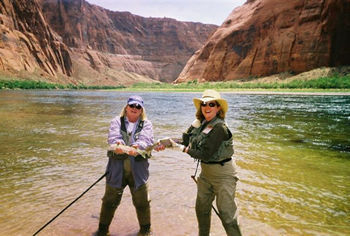 Three years ago, when the book "Castworks" was published, I was taken with the photos of fishing in the Grand Canyon. They were spectacular, and they were in black and white. Two years ago, I spoke with the rep from Lees Ferry Anglers at the ISE show but got busy setting up other trips. This year, it was my mission to set this trip up. I had also spoken with Jim Andras who guides out of The Fly Shop in Redding. He is from the Lees Ferry area and worked there for a few years before relocating to Redding. 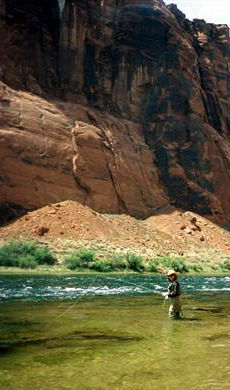 He recommended fishing in winter, spring or fall unless I really liked hot weather (average temperature in the Canyon can be 120 in the summer and there are no trees or shade until the sun move past the canyon walls). This year, I spoke with Captain Jeff Parker and Caleb Hitzfeld at the ISE show, and then booked a trip for May 15th and 16th with a friend, Diana Ross. The materials that they give you recommend flying into either Phoenix or Las Vegas and driving the 4 hours from either city. Instead, Diana and I flew out of San Jose to Flagstaff via Phoenix on May 14th. There are good connections on America West, and it saved 2.5 hours of driving each way. Flagstaff looks a lot like Bend without the river running through it – very pretty, surrounded by high altitude country. During our summer vacation we saw the Grand Canyon! 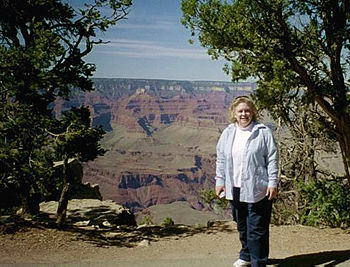 Diana had seen the Grand Canyon when she was in high school, "with just enough time to spit over the edge," but I had never been there. We drove up 180 and over 64 and stopped several places on the South Rim to take pictures. This doesn't do the view justice as it was slightly hazy in the Canyon. It is spectacular, but it's not where you fish. 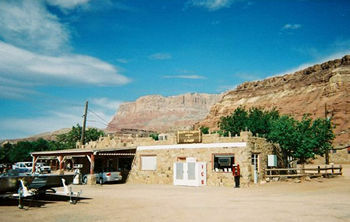 We continued on up to Lees Ferry through incredible red dessert and rock country. Cliff Dwellers Lodge is a very nicely appointed motel. Lees Ferry Anglers has a very well supplied fly shop. Cliff Restaurant is worth the trip. Food was fantastic. The next morning, we met Jeff at the boat launch, and backtracked 11 miles from the Lodge to a one-mile stretch of pocket water that you can walk, wade, and fish. Caleb specializes in guiding on this section, and it's the only walk-on access. The rest of the fishing water requires a boat to take you up-river. 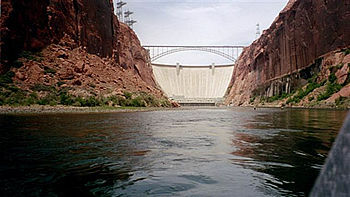 You fish 16 miles from the boat launch up to the Glenn Canyon Dam at the outlet of Lake Powell. I couldn't wait to see the pictures, which of course don't do it justice. This is a typical tail water and mostly you nymph. There isn't a hatch except for midges, but you can do a little dry fly fishing with a black and white skunk stimulator with which, for some reason, the fish like to entertain themselves. The midge nymphs are #80. Not really, but they were tiny 24's or smaller. You fish the rising water stepping back to shallow water with the water fluctuation. The water doesn't get very high where you fish and the wading is easy. 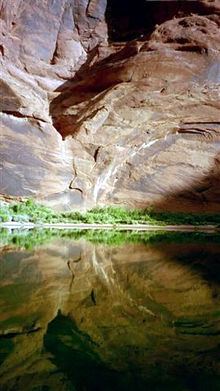 The water fluctuation stirs up the food in the rocks and the fish move in to feed. So instead of the fish facing up stream, they are more sideways feeding on side currents. At one spot, Jeff told me not to scuff my feet too much as I moved around, since I would bring in the "welfare fish." He left to help Diana and, after a few minutes, I noticed a couple of fish in front of me. I continued fishing and thought that at least I could feed these fish and make them fatter while I was trying to catch their relatives. So I started scuffing my feet – just a little bit. Next time I looked down, there were about 15 fish – and some really big ones – in front of my feet. By this time Jeff had come back and told me in no uncertain terms that I was not to fish for these fish. They were looking for a hand out and were not self-respecting fish. And it would embarrass him, as my guide, if I fished for them. I continued nymphing out into the side current as he instructed - until he left. He was right, you shouldn't fish for welfare fish. For one thing, it's impossible to get a good drift because, even when you lift your rod way up high, the flies keep getting stuck on your boot laces and if you can avoid your boot laces, you are out of the lane of opportunity. And, if you lift your rod way up high and do a semi-split with your legs and let the fly drift in between your legs, if you caught a fish, you could damage yourself setting the hook. 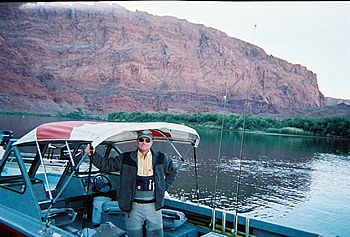 (See my article on the Green River where I talk about flossing the cutthroat.) And, besides, by the time you get in position and get the fly through your legs, the fish have already moved in front of your boots, and you still can't get a good drift. We still had great fishing. Diana caught the biggest fish of the trip. Most of the rest were about the size of the fish we doubled-up on at the top of this story. I have sent this picture to be put up in the dining room, so look for us there. I will definitely go back. 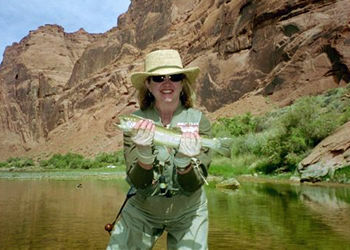 I like the spring or probably late fall with the possibility of doing a little dry fly fishing.